Today was a busy day for Manorville Fire Dept. Members. Started off at 02:30 hrs this morning with a Chief's investigation at EPCAL with 5-16-32, 2nd Asst Chief Philip Zackman Jr. handling that call. At 08:39 hrs an Automatic Alarm at Pine Hills Country Club Community Center handled by 5-16-52 Captain Joe Rosario. At 08:53 Automatic Alarm at Dunkin Donuts off of CR111 handled by crew of Engine 5-16-8. Then just as Engine 5-16-8 was finishing up with Brookhaven Town Fire Marshall on the 3rd Alarm, the 4th alarm toned out at 09:39 hrs. 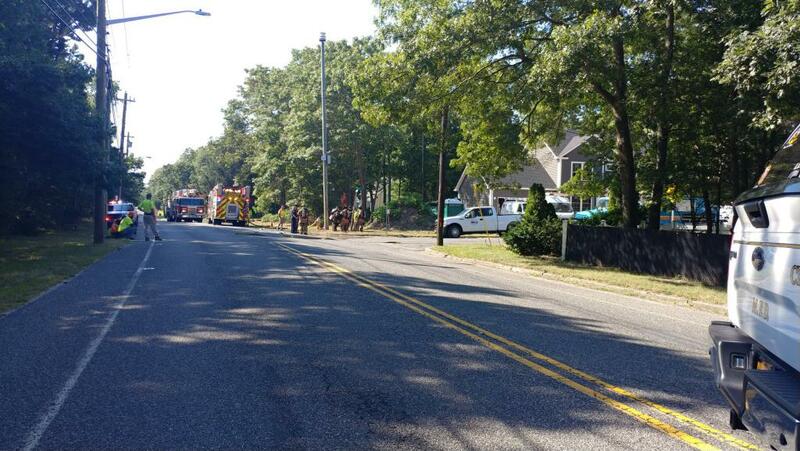 Captain Joe Rosario was first on scene to a Gas main rupture on Cedar Lane off of Wading River Rd. Once on scene Capt Rosario found that SCWA while digging for a new water service hit the Gas Main. Capt. Rosario had Ladder 6, Engine 7 & 8 stage on Wading River Rd. and had his manpower with SCWA locate the Street Gas Valve and turn off the gas to Cedar Lane until National Grid can preform needed repairs. Your local Volunteers ready and willing to SERVE their Community 24/7.